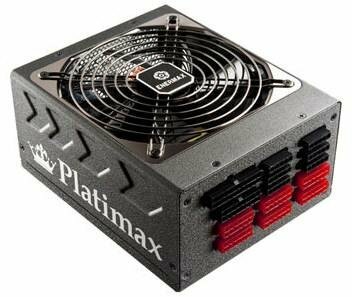 TC Mag writes Enermax has introduced the Platimax series, a line of 600W, 850W and 1200W PSUs with 80Plus Platinum certification. These units will be sold for $209, $279 and $329, respectively. Named Platimax, the new PSUs feature a modular design, an efficiency of up to 94%, 105°C Japanese electrolytic capacitors, a Copper-Bridge transmission array, an extreme density transformer, a 13.9cm Twister-bearing fan, and multiple (4 or 6) 12V rails. These units also make use of the SafeGuard multiple protection circuitries, the HeatGuard technology (keeps the fan running for up to 60 seconds after shutdown to cool off its components) and the CordGuard AC power cord fixing solution.